Jessie Taylor is furious when her roommate secretly posts her picture on the dating website LDS Lookup -- furious, that is, until she spends all night instant messaging Ben Bratton, a man whose wit and warmth just might make Jessie forget the train wreck of her last romantic relationship. Their first date is a smashing success (literally), but Ben's overall awesomeness can't save Jessie from having to deal with Craig, her competitive coworker whose baiting behavior sets new standards for obnoxiousness. Determined to beat Craig at his own game, Jessie spends long office hours finishing projects and putting out fires, but while her performance wows her boss, it only makes Ben skittish -- after a failed engagement to an up-and-coming lawyer, he's not about to pair up with someone who's married to her job. Will Jessie figure out how to be true to herself and take her big chance at love before it's gone with a click of the mouse? I knew I was going to love Twitterpated. I didn't have a single worry. I was also struck dumb by the eerie similarities within the first couple of chapters to my own life. Melanie, did you just write my memoir??? It sure felt like it!! Which was kind of awesome! I love the whole online dating beginning. It isn't so taboo anymore. More and more people are finding love this way--yours truly included. Jessie's roommate Sandy created a profile for her, without her permission. Jess decides to just give it a go. Why not? I really loved all the banter between Jessie and Ben. It was fun to see their first chat up lines and get to know you questions. Well, for that matter I loved the conversations between Jessie and her roommate Sandy too. I wish I was witty. It really was quite funny! The conversations felt real. Everything flowed well. I felt like I was watching it happen right in front of me. The one liner's are pretty classic. I really liked going on all those first dates with Ben. Took me back in time to my own first dates! It was fun and I'm so glad Ben didn't kiss on the 1st date. Good boy. I love it when a couple takes their time and gets to know on another first. That's how it should happen. It all felt very natural. Both Ben and Jessie have plenty of trials to get through which kept things interesting. I wanted to scream at Jessie there at the end though. Quit the job girl! Go get Ben!! I was practically willing them together by the end! I loved it you guys! I read it quickly, and just couldn't get enough. Totally cute and fun. It's a light read and I read it in one sitting. I love it when that happens. I'm really hoping we get more of Jessie and Ben's story. I know I'd LOVE more!!! I love what you are doing with your book blog! Sounds like a very cute book. I can't resist a sweet book with that first date feeling. I am totally entering that give-away! Sounds fantastic. I loved Melanie's other books! 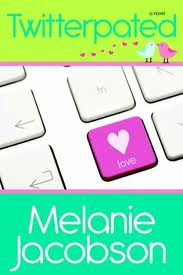 I LOVE Melanie Jacobson's books! Great review. Can't wait to read this one. Sign me up for the giveaway! @Christy You'll love it! Plus it isn't drowning in LDS stereotypes! It was totally cute and fun. It was nice of Melanie to offer a book for the giveaway! I love Melanie's books. Can't wait to read this one. Just discovered your blog from Melanie Jacobson's Facebook page...I'm a new follower, looking forward to reading your future posts! Another love story? Speed Dating Nottingham This cuteness makes me sick.